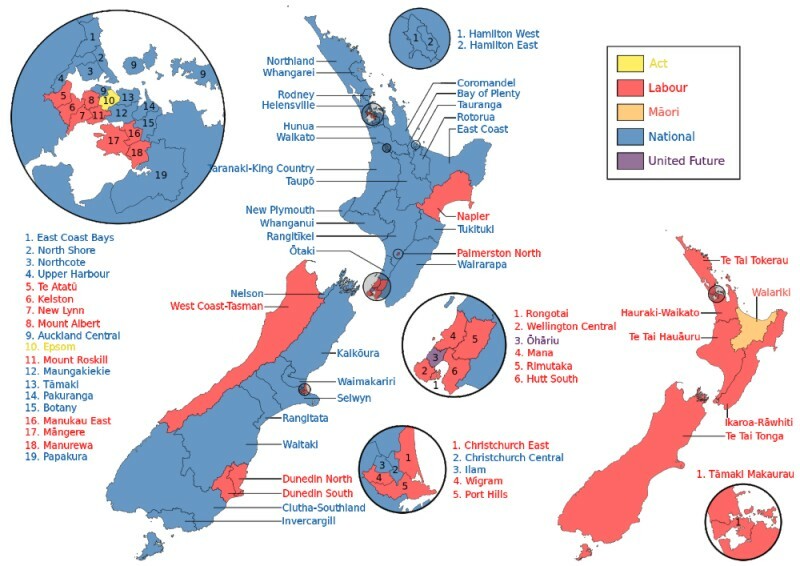 On Saturday, Prime Minister John Key’s National Party won the election with 1,010,464 votes, giving him enough seats to govern alone – something that many people thought was virtually impossible under MMP. in each election. In 2008, they won 44.9 percent of the vote and 58 seats, in 2011, 47.3 percent and 59 seats, and now in 2014, a remarkable 48.1 percent of the vote and 61 seats. Here are some extracts from John Key’s election night message to New Zealanders. Three more years! This is a victory for those who kept the faith. This is a victory for those who refused to be distracted, and who knew that a vote for National was a vote for a brighter future for all New Zealanders. This is a victory for the people the policies, the unity, and the vision that National will bring to government for the next three years. And so for the third consecutive election night I stand in front of you proud that more New Zealanders have given their party vote to National than any single party. For the third consecutive election night I stand here delighted that there will be more National MPs in the Parliament than from any other single party. For the third consecutive election night I stand here ready to lead our country into work with like-minded parties to continue to provide the strong and stable government that is working for New Zealand. I feel both humbled and at the same time energised by the result and the prospect of a third term. And I want to thank everyone, who in the hope and expectation that National would continue to lead a strong, stable government, came out – over a million of you – and gave your party vote to National. MMP was designed to encourage parties to work together so over the coming days I will talk to other leaders of political parties with a view to putting together a broader majority and to ensure a durable and strong government. In the meantime I can assure New Zealanders that everything else will continue ticking over as usual. For the past six years I’ve enjoyed a privilege afforded to only a very small group of New Zealanders – and that’s to lead our country. In that time I’ve never stopped marvelling at the creativity, the ingenuity, the compassion, the generosity, and kindness of New Zealanders. We are the finest little nation on the planet – and I truly believe that. And our future as a country is bright, our opportunities are unlimited. So tonight, whoever you voted for, I can pledge this to you, that I will lead a government that governs for all New Zealanders. And although as New Zealanders we hold a range of political views, I think we can all, as a nation, agree on one thing – we are lucky and rightfully proud to call New Zealand home and to be Kiwis. John Key is so right – New Zealand is the finest little nation on earth, and in spite of our differences in values and beliefs, we are deeply proud to be Kiwis and extremely lucky to be able to call this country our home. Thanks to the careful stewardship of John Key and his Finance Minister Bill English, New Zealand is growing at a remarkable four percent. Up to two-thirds of voters agree, in the regular “right track/wrong track” polls, that the country is moving in the right direction. That’s why, the doom and gloom messages from left wing parties – Labour, the Greens, and Internet-Mana – about how bad the economy is doing and why a radical change in direction is needed, did not resonate with voters. Voters did not want to risk our hard earned economic gains by supporting parties that were planning to take us backwards with a failed policy agenda of higher taxes and more government spending. They did not want a return of nanny state telling us that the government knows better than we do how to run our lives. Nor did they want a tsunami of overbearing regulations to restrict our freedoms and crush our entrepreneurial spirit. The reality is that deep down New Zealanders are very aspirational. That’s why we have such a high rate of income mobility. Most people want to live in a country where hard work and enterprise are valued and rewarded, not penalised through higher taxes. “A total of 2,112,522 votes have been counted. The final election result can be expected on Saturday week – October 4 – when the 254,630 special votes will have been counted, and all votes recounted. “The 2014 Parliament will have 121 seats, an overhang of one as a result of Peter Dunne winning Ohariu but his party United Future gaining just 0.22 percent of the vote. “At this stage, 6.2 percent of the vote has been wasted – 4.12 percent from the Conservatives, 1.26 percent from Internet-Mana and the balance from a number of minnows, including 895 votes from Brendan Horan’s NZ Independent Coalition Party. That reduces the effective vote count to 93.8 percent, so National’s 48.06 percent becomes 51.2 percent or 61 seats in a 121 seat Parliament. Frank examined advance voting: “A unique feature of this year’s vote was the prevalence of advance voting. Over 700,000 advance votes were cast (compared with 330,000 in 2011 and 270,000 in 2008). That’s a staggering 30 percent of all votes cast. The growth is probably because more people are now more aware of it than previously. The hijacking of the election campaign by the left’s Nicky Hager and Kim Dotcom – with the help of the media – was the real scandal of the campaign. Many important policy issues that should have been debated were buried under the media hype. But their attempts to derail National backfired. Voters wanting to own their election campaign objected to the interference from outsiders and tuned out, throwing their support behind the Prime Minister. And in a bizarre twist, after endless berating about the evils of security intelligence agencies, news hit the headlines in the finals days of the campaign, of an Islamic State terrorist plot in Australia to kidnap and publicly behead a random member of the public. The extreme threat was uncovered through the surveillance of intelligence agencies, highlighting the crucial role they play in keeping citizens and countries safe. The Prime Minister is determined that his third term government will work hard for all New Zealanders, will keep its feet firmly on the ground, will not become arrogant, and will not veer off course. He is committed to building a broad coalition by reaching out to the parties he has previously worked with – ACT, United, and the Maori Party – as well as possibly New Zealand First, with a memorandum of understanding. National’s majority in the House, will however, enable the passage of important reforms that other parties had previously blocked – namely the Resource Management Act and Employment Law. So what can we expect from a third term National Government? A return to surplus this year. A reduction in net government debt to 20 percent of GDP by 2020 and a resumption of payments to the NZ Super Fund. A reduction of ACC levies on households and businesses by around 30 percent starting in 2016. A reduction in income taxes for low and middle income earners from 2017 as long as economic and fiscal conditions are suitable. A reduction of core Crown spending to below 30 percent of GDP by 2017/18 from 34.4 percent in 2008/09 under the previous Labour government – to keep interest rates lower for longer. National plans to use the remaining $1.7 billion of proceeds from the Government’s asset sale programme for new public assets – schools, hospitals and regional roads. They intend pressing ahead with welfare reform, promising to reduce the number of people on benefits by 25 percent from 295,000 to 220,000 over the next three years. In particular, they want to reduce by 40 percent the 53,000 young people aged between 16 and 24 who are on benefits. To achieve these results, more childcare assistance will be available, incentive payments will be offered to beneficiaries who stay in the workforce, Youth Services will be extended to all teen parents and many 18 to 24 year olds, young people will be helped to get their driving licences, the successful $3,000 incentive scheme to get beneficiaries to move to Christchurch will be extended to other regions with a shortage of workers, and regional Work Skills schemes will get young people on benefits working in their communities. 1. Negotiating and signing more Free Trade Agreementsto lift export output. 2. Reformingthe Resource Management Act to improve resource allocation decisions. 3. Holding Kiwi expat Job Fairs in Australia to recruit skilled Kiwis for New Zealand jobs. 4. Boosting information and communications technology, and increasing the number of engineers. 5. DoublingResearch and Development to 1 per cent of GDP by 2018 to boost innovation. 6. Increasing Ultrafast and Rural Broadband so the whole county has world-leading coverage. 7. Passing the Employment Relations Bill to ensure flexible labour markets that create more jobs. 8. Delivering IRD’s Business Transformation Project to reduce tax compliance for businesses. 9. Accelerating petroleum and minerals exploration through the new data acquisition programme. 10. Completing more key roading projects to improve economic growth opportunities and safety. As far as education is concerned, National is committed to lifting student achievement by investing $359 million over four years to keep the best teachers teaching, to encourage schools to work together, and to strengthen school leadership. In health, free GP visits and prescriptions to under-13s will be available from July 2015, and there will be a greater investment in health services including reducing pain, providing more operations, speeding up cancer treatment, and increasing hospice funding. Paid parental leave will be extended to 16 weeks next year, and then to 18 weeks in April 2016 – as well as increasing the maximum parental tax credit to $220 a week. KiwiSaver will be changed to provide a $20,000 Home Start Grant to assist an estimated 90,000 first-home buyers with their deposit. National has also prioritised reductions in family violence and crime, as well as a crackdown on gangs. With gang members responsible for 25 per cent of murder charges and a third of serious drug offences, the offensive against gangs will include 24 hour GPS monitoring for high-risk affiliates on release from prison, new Firearm Prohibition Orders to stop gang offenders buying weapons, a Gang Intelligence Centre to increase surveillance on gangs, drug dogs at ports and airports to target drugs being transported within the country, and taskforces to prevent drug trafficking by motorcycle gangs. Priority will be given to getting relatives and children out of inter-generational gang lifestyles. In addition a “Start at Home” initiative will be established to enhance rehabilitation programmes for prisoners, boost access to addiction services, employment opportunities, and housing – including in new locations away from gang life. With voters delivering Labour their worst defeat since 1922, and causing the Greens to lose ground, what were the policies they so resoundingly rejected? All in all, we avoided higher taxes, death duties, a new carbon tax, new taxes for using freshwater, the nationalisation of power companies, meddling with the Reserve Bank Act, an increase in power to the unions, an increase in power to radical environmentalists, and an increase in power to Maori supremacists. In his election night speech, John Key promised that the government will continue ticking over as usual. After the roller-coaster election campaign we have all had to endure, going back to life as usual sounds exactly what the country needs! Please share your feedback on the election and let us know whether you were pleased with the final result – yes, no, not sure? *All poll results can be viewed in the archive.